As I read in The Guardian about Facebook’s business becoming a danger to democracy, I think about the German village down the road. The remnants of Nazi barracks that once housed brown uniformed followers of Adolf Hitler have been transformed into the European Institute of Applied Buddhism by brown robed followers of Thich Nhat Hahn. If a ‘commercial firm behaving accordingly’ has become a danger to democracy, does the danger lie in ‘commercial firm’ or ‘behaving accordingly’? Songwriters, musicians and recording artists, well known for not fitting in to the roll of being commercially firm or behaving accordingly, are invited to transform the barracks of capitalism and take up residency in collaborism - a humanitarian economic model based on collaboration instead of competition. I've been walking these woods for the last nine months. Long Mountain down to the Valley of the Butterflies, then back up Coal Mountain to the village where you can find me. I've visited with red tail hawks and great blue herons, brown deer and red foxes, wild hares and even a caught a glimpse of a shy weasel, dragonflies and butterflies, songbirds and snails, clouds and rain and soon comes snow. It's always the same trail, but it's never the same tale as everyday brings changes from the wind in the trees, leaves emerging and leaves falling, wild cherries in the Spring, beechnuts and hazelnuts and walnuts in the Fall, the farmers and the shepherds, the cows and the sheep, the grasses and wildflowers, meadows, woods and creeks, the earth and sky, all this living breathing conscious nature opening windows to the mystery of life. We love the Jones Benally Family. Jess Klein and Mike June made a special trip back to Windeck on their whirlwind tour of European countries in September and October. Late on a Saturday night, we set up the studio and recorded a beautiful version of Jess's "My Own Beating Heart". She's contributing downloads of the recording to the digital album "Swimming In Blackwater". 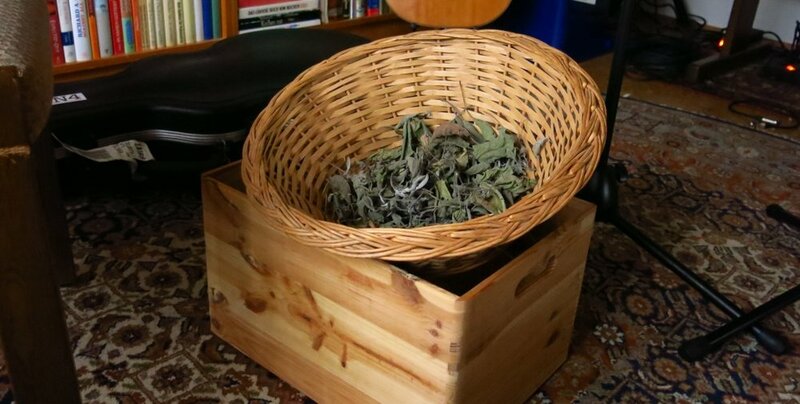 I remember Jess was looking for a sound, she described what she wanted, and I thought of the basket of drying sage we had harvested from our garden. Sage has a special significance in the lives of many people. I'm glad it made it's way into the music. Private performance, although admission is free, a generous donation is requested. Teaching herself to play her father’s acoustic guitar in her teens, she began writing songs as a college student in Kingston, Jamaica. Relocating to Boston, she self-released her debut album "Wishes Well Disguised", then recorded two more albums for the Rykodisc label, and began touring internationally. Jess moved to Austin, TX in 2008, recording and released three more albums "City Garden", "Bound to Love" and 2012′s "Behind A Veil". Nachdem sie in ihrer Heimatstadt New York, auf Jamaica, in Boston und in Austin gelebt hat, nennt Singer-Songwriter und Gitarristin Jess Klein nun North Carolina ihr Zuhause. Seit 16 Jahren präsentiert Jess Klein ihre Musik auf internationaler Ebene. Sie begeistert ihr Publikum sowohl auf den großen Bühnen, wie dem ‘Fuji Rock Festival’ in Japan, oder dem ‘Telluride Americana Fest’ in Colorado als auch bei Clubkonzerten rund um die Welt. In diesem Monat ist Jess mit Mike June, einem Songwriter aus Austin, Texas, hier in Kohlberg zu Gast. Wir freuen uns, Jess Klein und Mike June bei uns im ‘ArcheHof Windeck’ am Donnerstag, den 29.September 2016 um 19:00 Uhr begrüßen zu können. World Champion hoop dancer and traditional healer Jones Benally, his daughter Jeneda, son Clayson, and grandchildren form the Jones Benally Family Dancers. Three generations bring together the healing power, beauty and profound messages of Navajo (Diné) culture to educate and uplift audiences around the globe. The Jones Benally Family gives an unparalleled introduction to Navajo music an dance. Navajo dance is a sacred tradition encompassing a wide variety of forms, all of which aim to heal the body, mind or spirit. The family's emotive vocals and chanting, along with accompaniment on traditional rhythm instruments, amplify the ceremonial mood. The Benallys' repertoire of ove 20 dances includes traditional forms such as basket dance, eagle dance, feather dance and corn grinding. The hoop dance is always a highlight, as audiences marvel at the phenomenal natural figures and shapes Jones can evoke so fluidly with five, nine, a dozen or many more hoops. Jones Benally is a respected elder of the Navajo Nation in northeastern Arizona where he works as a healer. He was among the first traditional medical practitioners to be employed by a 'Western' medical facility, where he worked for over 20 years. Jeneda and Clayson have performed with their father for over three decades. Die ‘Jones Benally Family Dance Troupe’ kommt aus Black Mesa, Arizona. Jones Benally ist nicht nur ‘World Champion Hoop Dancer’, Weltmeister im Reifentanz, sondern auch ‘Medizinmann’ und traditioneller Heiler der Navajo (Diné) Nation und wird als “Living National Treasure” geehrt. Er, sein Sohn Clayson, seine Tochter Jeneda und ihre beiden Töchter zeigen dem Publikum weltweit die Schönheit und die profunden Botschaften der Navajo (Diné) Kultur durch traditionelle Tänze und Musik. Im Weißen Haus ehrte Michelle Obama Jeneda mit der ‘National Medal For Museum and Library Services’ für ihr soziales- und bildungspolitisches Engagement. Jeneda und Clayson sind, außerhalb der Family Dance Troupe, die “Multi Award Winning” Band ‘SIHASIN’, die mit ihrem Mix aus Navajo und Folk/ Punk Sounds und ihren politischen Texten das Publikum auf den großen internationalen Festivals begeistert. The following is an excerpt of a rough translation of a newspaper article in the "Mitteilungsblatt Windeck" written by Jak Bönisch. The full article is posted below. Johannes Remmel, NRW Minister for Climate Protection, Environment, Agriculture, Conservation and Consumer Affairs, visited the ArcheHof Windeck during his "LAND, PEOPLE, HOME" tour on September 3, 2016. Many farmers and representatives of Fairtrade and environmental organizations, at the invitation of the hosts will Lisa Anschütz and Kalle Gross, expressed concrete concerns, questions and suggestions in the technical discussion with Minister Remmel and Secretary of the State of NRW Horst Becker (both members of B '90 / Die Grunen) . In particular, the elimination of bureaucratic obstacles, restrictions and regulations that make meeting the businesses concerns in our small-scale central mountain region particularly difficult was a concern for the farmers. Both the Minister and Secretary of State had an open ear for the needs of the farmers and gratefully took suggestions. In sunny late summer weather the meeting by the huge cake was - fresh from Great 'Backes - sweet. The singer and guitarist Barbara K from Austin, Texas and the guitarist and songwriter Wolfgang Pracht, both living on the Archehof, put on the proverbial icing by performing the self-written "My Name Is Truth" and "Swimming in Blackwater" - both songs levying a profound political statement. Auf seiner "LAND, LEUTE, HEIMAT"-Tour machte Johannes Remmel, Minister für Klimaschutz, Umwelt, Landwirtschaft, Natur- und Verbraucherschutz, Station auf dem Arche-Hof in Windeck-Kohlberg. Etliche Landwirte und Vertreter*innen von Fairtrade- und Umweltschutzverbänden waren der Einladung der Hofbetreiber Lisa Anschütz und Kalle Groß gefolgt und äußerten im Fachgespräch mit Minister Remmel und Staatssekretär Horst Becker (beide B' 90 / DIE GRÜNEN) konkrete Sorgen, Fragen und Verbesserungsvorschläge. Insbesondere der Abbau von bürokratischen Hindernissen, von Einschränkungen und Vorschriften, die die Betriebe in unserer kleinteiligen Mittelgebirgsregion besonders hart treffen, war den Landwirten ein Anliegen. Warum darf ich eine Milchtankstelle nicht an der Landstraße bauen, wo die Leute vorbei kommen, sondern nur auf dem eigenen abgelegenen Hof, den so schnell niemand findet? Warum werden land- und forstwirtschaftliche Erschließungsstraßen gebaut, wenn dann kein Geld für deren Pflege bereit gestellt wird? Warum werden den kleinen Bauern Auflagen gemacht, an die sich die großen nicht halten? Kann es sein, dass bei der Vermarktung von Rindfleisch strenge Grenzwerte für PCB-Belastung gelten und die Landwirte die kostspieligen Analysen selber bezahlen müssen, während für höher belastetes Wildfleisch gar keine Grenzwerte existieren? Minister und Staatssekretär hatten für die Fragen und Nöte ein offenes Ohr und nahmen manchen Vorschlag dankbar auf. Besonderes Ministerlob gab es für die beiden Archehofbetreiber, die mit der Aufzucht von alten Haustierrassen dafür sorgen, dass die genetische Vielfalt erhalten bleibt, die bei der ansonsten verbreiteten Massentierhaltung auf der Strecke bleibt. Die Tatsache, dass auf dem Nebenerwerbshof ein kleines aber allen modernen Anforderungen genügendes Schlachthaus gebaut und damit eine sinnvolle Hofvermarktung ermöglicht wurde, zeige, dass bei aller Reglementierung auch noch vernünftige Lösungen möglich sind. Das Beispiel sollte Schule machen und Nachahmer finden. Bei sonnigem Spätsommerwetter wurde das Treffen durch die riesigen Blechkuchen - frisch aus Groß' Backes - versüßt. Die Sängerin und Gitarristin Barbara K., die es aus dem texanischen Austin auf die Windecker Höhen verschlagen hat, und der Gitarrist und Songschreiber Wolfgang Pracht, beide auf dem Archehof lebend, setzten der illustren Versammlung das sprichwörtliche Sahnehäubchen auf, indem sie mit den selbstgeschriebenen Songs "My Name Is Truth" und "Swimming in Blackwater" ein tiefgründig politisches Statement abgaben. On Monday, July 25th, Christoph Wilmsen-Wiegmann arrived to install the sculpture he created that had been commissioned by Kalle and Lisa here at ArcheHof Windeck. There is a craft to writing songs. And there is an art. The craftsman builds songs from words and notes. The artist receives songs from the sky, or the wind, or both, or neither. Laughter is heavy, it falls like an apple from a tree, sweet and ripe. But sadness, it lingers, alone and forsaken, it falls slowly like leaves in the night. Townes Van Zandt, long after he died, introduced me to Wolfgang Pracht. It was actually Larry Monroe who made the posthumous introduction. Townes knew Wolf through the songs he had sold to an agent from Nashville that other songwriters were playing. Yes, there are people who make a living peddling poetry and pretty melodies to singing songwriters who have lost the key to the self-locking door of Mystery. One fine day on the streets of Köln, two songwriters chance to meet - one from Texas who would be playing that night, the other a traveler from a small German village about a 45 minute train ride away. "Excuse me, sir, are you Townes Van Zandt?" asked Wolf. "Yes I am. Who are you?" replied Townes. "My name is Wolfgang Pracht. I've been wanting to meet you for many years." "Wolfgang Pracht? Wolfgang? I've been wanting to meet you for years. What are you doing here in Germany?" "I live here." replied Wolf. "You live here?" asked Townes. "I was born and raised in a village about 75 kilometers east from here." "You're from Germany? I thought you were an American." "I'm German. Might you have time for a cup of coffee? There's a cafe around the corner from here...."
15 years and one lifetime later, when I first met Wolf face to face, it was through the open doorway where Townes used to sleep when he hung out in Austin. Our friendship had actually begun 9 months earlier when Wolf reached across the Atlantic and gave me a call. He had just heard the music on my first album recorded after the breakup of my band Timbuk3. I had offered Wolf a place to stay when he came to town to visit friends, so I picked him up and took him home. That evening, Wolf asked me a complicatedly simple question. "What do you mean, what do I want?" I replied. "Just that. What do you want?" "Nobody's ever asked me that before." Just that, in an of itself, revealed to me the location of a vast unknown of which I had been totally unaware. It was like standing in an open doorway of unlimited possibility like a proverbial deer in headlights, and the doorway kept opening wider and wider. I was ready to bolt. But to where? When time started moving forward again, I found the words to express my deepest desire. "I want to write songs that hold magic for those who hear them, songs that heal the hidden wounds. And I want to grow as an artist and as a musician." "I think I can help you." Wolf said with a smile. Later that night, after dinner, as we sat on my balcony overlooking the ravine that ran down to the Colorado, I watched with wonder as little clouds, like sheep, passed before my eyes, so close I could actually reach out and pet them, illusive little mysteries, magically appearing and disappearing, again and again and again. In that moment I instinctively knew that my life would never be the same. We gathered at Haus Schladern, built in the early 1400's and clearly the oldest house in the village, for a day of art and community activity. We were there to help children paint a cow. The kids came from refugee families and local families. Our hosts, Familie HotSchulz, were gracious and accommodating. Many local businesses contributed supplies. The cow was donated by Connie and Harald. Lisa helped the children with the painting. Artists from Damascus, Bagdad and a few German parents added some finishing touches. Cake and coffee was served. The sun shined all day long. A great time was had by all. "An der Aktion für Flüchtlingskinder und deutsche Pänz können alle teilnehmen. Kinder haben dabei die Gelegenheit, sich beim Malen kennenzulernen und Kontakte zu knüpfen. Bemalen können sie eine lebensgroße Kuh sowie Stellwände, an denen mit Fingerfarben gearbeitet wird. Außerdem darf jedes Kind eine Probe seines Malens mit nach Hause nehmen. Für Pänz, die nicht malen wollen, gibt es Spielecken. Dazu werden Getränke, Kaffee und Kuchen geboten (für Kinder kostenlos). "Der Eintritt ist für alle frei, es wird aber um Spenden zugunsten der Windecker Flüchtlingshilfe gebeten." The Paper Moon Shiners from Austin, Texas, are on tour in Northern Germany for the month of April. We welcome Elena and Frank for an extended weekend retreat in the 'German Hill Country'. We'll be hosting them here on the farm in all of it's Springtime glory, baby cows and lambs, budding and flowering trees, hidden springs gushing forth from the hillsides filling creeks with water and the air with song, birds nesting and moon waxing. On Saturday, we'll celebrate the project Wolf and I have been researching through the Winter months: village retreats for performing songwriters. Our friend Lisa H. has graciously invited to host our musical guests for a private party that will feature a bit of live music. Last week at a birthday party for a doctor living in a neighboring village, a celebration of 75 years of dancing around the sun, we met a sculptor from Damascus, a refugee in Germany who recently fled the ravages of war from his home in Syria. Besides his mother tongue, he spoke pretty good English and a little German. With bright eyes and laughter, we engaged in conversation, he in English and me in German. We talked about art and culture, and our new lives in a new country. Having participated for six months last year in a German language and cultural integration school with people from Morocco, Egypt, Turkey, Syria, Russia, Kazakhstan, Poland and Thailand, I was well aware of the challenges we all face speaking in a new language. Many of us are terrified of making mistakes. Most of us were unwilling to speak at all. We had to find a way to overcome our fear of speaking. Eventually we began to play with our speaking inabilities. Einfach sprechen, sprechen, sprechen. We began to have fun making mistakes. We learned to laugh with each other and not at each other. We spoke like children speak, simple words, slowly, waiting for full understanding before moving on to the next thought we wished to convey. Most of all, we want to understand each other. And as we understand, we, like children, learn and grow.